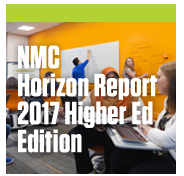 The NMC Horizon report describes emerging technologies likely to have an impact on learning, teaching and creative inquiry in education. The full reports covers six key trends, six significant challenges and six important developments in educational technology. Reproduced below are the top ten highlights from the executive summary which capture the big picture themes that underpin the eighteen topics. Advancing progressive learning approaches requires cultural transformation. Institutions must be structured in ways that promote the exchange of fresh ideas, identify successful models within and outside of the campus, and reward teaching innovation — with student success at the center. Students expect to graduate into gainful employment. Institutions have a responsibility to deliver deeper, active learning experiences and skills-based training that integrate technology in meaningful ways. Collaboration is key for scaling effective solutions. Communities of practice, multidisciplinary leadership groups, and open social networks can help spread evidence-based approaches. Institutions and educators can make more progress learning from each other. Despite the proliferation of technology and online learning materials, access is still unequal. Gaps persist across the world that are hampering college completion for student groups by socioeconomic status, race, ethnicity, and gender. Further, sufficient internet access remains uneven. Processes for assessing nuanced skills at a personal level are needed. Adaptive technologies and a focus on measuring learning are driving institutional decision-making while personalizing student learning experiences; leaders must now consider how to evaluate the acquisition of vocational skills, competencies, creativity, and critical thinking. Fluency in the digital realm is more than just understanding how to use technology. Training must go beyond gaining isolated technology skills toward generating a deep understanding of digital environments, enabling intuitive adaptation to new contexts and co-creation of content with others. Online, mobile, and blended learning are foregone conclusions. If institutions do not already have robust strategies for integrating these now pervasive approaches, then they simply will not survive. An important step is tracking how these models are actively enriching learning outcomes. Learning ecosystems must be agile enough to support the practices of the future. In using tools and platforms like LMS, educators have a desire to unbundle all of the components of a learning experience to remix open content and educational apps in unique and compelling ways. Higher education is an incubator for developing more intuitive computers. Lifelong learning is the lifeblood of higher education. Institutions must prioritize and recognize ongoing learning — both for their faculty, staff, and students.